Government Forces Liberated 65% Of ISIS-held Yarmouk Area, Other Facts And Numbers In Russian Military’s May 4 Press Briefing 5.1666666666667 out of 5 based on 24 ratings. 24 user reviews. On May 4, Russian Defense Ministry Spokesman Major General Igor Konashenkov held a press briefing adressing the situation in southern Damascus, eastern Syria as well as the alleged April 7 chemical attack in Douma and the recent reports that the US State Department had cut off the funding to the White Helmets. More than 63,800 people have returned back to the liberated Damacus subrub of Eastern Ghouta. 5,219 militants have laid down their arms and have been granted amnesty. 9,508 people have returned to the government-held part of Aleppo province from the Idlib de-escalation zone via the Abu-Duhur and Tall-Sultan humanitarian corridor. The Russian Armed Forces jointly with the Syrian authorities are working on stabilizing situation in the Syrian Arab Republic. The Syrian government troops are completing operation to liberate territory of Yarmouk from terrorists – the former Palestinian refugee camp on the southern outskirts of Damascus. Over the last six years the region has turned into a refuge for ISIS terrorists that arrive when armed formations defeated in various parts of Syria. When the operation is completed, the Syrian capital will be totally liberated from illegal armed units. At present, the ISIS units in west Yarmouk have been splitted, there are being eradicated separately. More than 65% of the suburb is under control of the government troops. Illegal armed formations that control Yalda, Babila, Sidi-Migdat, Bayt-Saham regions have signed agreement on ceasefire, surrendering weapons and voluntary withdrawal of militants to the northern parts of Syria. Militants surrendered 1,236 pieces of small arms to the government troops. Operation on withdrawal militants with families from east Yarmouk has been underway since May 3 via the Beit-Saham humanitarian corridor. Over the last 24 hours, 1,348 people left the area, including 506 militants, 842 members of their families. Militants with families left for al-Bab by 36 buses escorted by the Syrian Arab Red Crescent (SARC). Those who decided to stay are going to use amnesty granted by government to return back to peaceful life. Russian specialists are rendering assistance to the Syrian authorities in recovering civilian infrastructure in the Eastern Ghouta and Eastern Qalamoun that had been recently liberated from terrorists. These regions are being cleared up; socially significant facilities are being recovered; power and water supply systems have been rehabilitated. The Russian military police provide assistance to local authorities to maintain public order constantly patrolling the territories in order to ensure stability and prevent possible provocations. The Russian Centre for Reconciliation of Opposing Sides continues its work on providing humanitarian assistance to civilians in regions that had been liberated from militants. Over the last seven days, the Russian military have carried out ten humanitarian actions delivering 25 tons of food supplies and the bare necessities to civilians. More than a thousand of people have been provided with medical assistance. Meanwhile, the scale of humanitarian relief provided by the UN and Russian is still less than people’s needs in liberated regions. In this regard, the position of the USA and some European countries, announced at the latest donor conference in Brussels, is considered to be the most cynical prohibiting any humanitarian supplies to the territories controlled by the Syrian government. It is to be stressed that almost 90% of the Syrian population lives in the territories controlled by the Syrian government. The so-called “international assistance” per one person in areas controlled by irreconcilable opposition and terrorists is 34 times higher than in regions controlled by legal authorities. These figures clearly show that all statement that we hear from Washington, London and other European capitals on alleged aspiration to help war-affected Syrians is nothing more than an idle talk. Most serious humanitarian situation remains in the US-controlled regions that had been early liberated from the ISIS terrorists. I refer first and foremost to the Rukban refugee camp located in al-Tanf region, occupied by the American troops, and Raqqa – the ISIS former capital. Despite some earlier encouraging statements, the US representatives do not allow to deliver any humanitarian supplies to the Rukban refugee camp with some 50,000 Syrians in need, the vast majority of whom are women, elderly people and children. The U.S. Army regional command refuses to guarantee the UN and SARC humanitarian convoys safe access to al-Tanf, insisting that food, water and the bare necessities supplies should be handed over only to the US-controlled militants. We saw the same situation back in Aleppo, the Eastern Ghouta and Deir ez-Zor, when people in struggle for living had to take arms and fight against legal government in order to survive and to be able to feed their families. It is to be reminded that when the abovementioned cities had been liberated from terrorists, there were vast stocks of food, medical and other humanitarian supplies at the terrorists’ depots. And at that time Syrians were dying from hunger and diseases. Hundreds of Syrians affirm it, and speak about it in interviews with foreign mass media. Is not this a crime against humanity? Another serious humanitarian situation remains in Raqqa that has turned into ghost city as a result of carpet bombardments carried out by the international coalition. Since Raqqa was liberated from terrorists, civilians are deprived of humanitarian aid from international organizations as the USA does not allow their humanitarian convoys to enter the area. At the same time, the USA and its allies render no assistance to civilians in Raqqa. Amid this situation, the Syrian government jointly with the Russian Centre for Reconciliation of Opposing Sides is working on establishing environment so that people can get back to their former homes. More than 63,800 people have returned back to the Eastern Ghouta. In total, 5,219 former members of illegal armed formations have laid down their arms and have been granted amnesty. Besides, 9,508 people have returned to Aleppo province from the Idlib de-escalation zone via the Abu-Duhur and Tall-Sultan humanitarian corridor. Since December 4, 2017, in Deir ez-Zor province, 46,747 people have returned back to the settlements on the eastern shore of the Euphrates. Over the last week, more than 2,700 civilians have returned back to their homes. The working team of the Organization for the Prohibition of Chemical Weapons has completed its mission in the city of Douma. The OPCW group has been investigating the alleged chemical attacked on April 7. The Russian Centre for Reconciliation and Russian military police ensure immunity and safety of all items and sites of alleged chemical attacks detected in Douma when the city had been liberated from terrorists. Investigators were provided with total and unimpeded access to all areas, objects and facilities and worked as long as they need. The Russian military police jointly with the Russian Centre for Reconciliation did its best to ensure safe operation by the OPCW mission in Douma. It is to be stressed that the Russian military often worked at risk to their lives. When operating in the Eastern Ghouta, the OPCW experts visited two flats where poisonous agents had been allegedly used, and took some samples. Besides they visited a terrorists’ laboratory and a chemical depot. The investigators also visited the Douma Hospital in order to cross-examine locals and those who took part in a staged video made by the White Helmets organization, and also took required samples. It is to be reminded that on April 26, the Russian side transported those saw and participated in the shooting of the staged video to the OPCW headquarters in The Hague. During the briefing, the state-members were able to personally question the eyewitnesses. Within the framework of the event, the Russian Ministry of Defence showed inconvertible facts proving that all so-called evidence issued by the White Helmets were staged. It is unclear, why representatives of the USA and some European countries which were the first to yell about alleged chemical attack in Douma on April 7 did not express their desire to speak in person in The Hague with eyewitnesses of the White Helments’ provocation. However today, when we see so many fact and eyewitnesses of that monstrous provocation, all becomes clear to everyone. Maybe that is the reason why there is information that the USA halted funding of the White Helmets. It seems that results of the fraudsters’ activity do not justify the financial investments. At present, we are waiting for report of the OPCW commission with results of their operation in Douma. We are closely following the situation in Syria and will keep you posted about all changes. You can take information to the bank! Americans are despicable and should be expelled from any foreign lands back to their own country. After full liberation of Syria all Muslim nations Egypt, Jordan, Syria, Lebanon, Turkey, Russia, China and Pakistan will come together to liberate Palestine from illegal European migrants Israel by using their weapons and army units. UK have taken Palestine by their own proxies/terrorists Israel and every week slaughtering 600 Palestinians when they protest against Israeli migrants and their illegal occupation on their land and have oppressed them since 1900. You have any more good jokes to share? Good briefing. RuMOD know their hokey. Too bad that 99% of westerners will never hear it. So what does the blue represent? 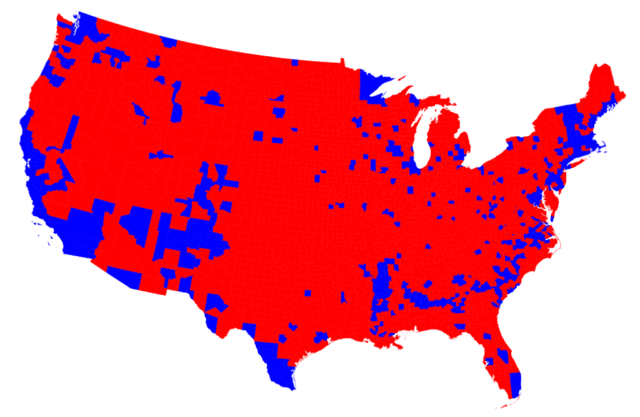 Counties that voted for Clinton. Now it is very important that a UNSC emergency meeting should be called in which a strong bullyman is needed with strong English accent to do emotional speech in English language with loud voice that there is no reason that without Syrian government approval anybody from US, UK, France, Israel etc. to cross Syrian political border and inside Syria either support any terrorist group with weapons or finance or to kill anybody inside Syria or to hold any part of Syrian land for himself to establish any sort of business or to establish military bases there or to hold it for some other groups to establish governments there. Why I am telling this to the UNSC forum because US, UK, France, Israel etc. are committing these crimes in Syria. Till this time US, UK, France and Israel have martyred about 300,000 Syrian civilians, servicemen and their allies in which Russians, Iranians, Lebanese, Palestinians are included. US, UK, France, Israel etc should know that the parts of the Syrian land that you have held across Europheti river both sides in Deir Ezzor, Hsaka, Raqqa etc or Golan Heights are the parts of Syrian land where Syrian nation are living which you have held hostage there. This is completely unacceptable for Syrian government and for Syrian nation. Syria is the land of Syrians. Syrians are not European Israeli migrants in Palestine that have illegally occupied Palestinian whole land and needed to be removed. US, UK, France and Israeli migrants know very well that they are committing international crimes by repeated air strikes on Syrian nation. Syrian nation needs protection from US, UK, France and Israeli thugs. All US, UK, France and Israeli thugs should immediately leave whole Syrian land. Syrian nation don’t wanna to become colony state of these thugs. Second if these foreign regimes have any concern with Syria then these bastards should straight talk with Syrian president Assad and they should not contact with Syrian terrorists that they have injected into Syria like ISIS, Al-Qaeda, White Helmets etc. Thousands of Syrians have been born in UK and they can easily do this speech for Syria. I surprise that how these morons each year invade new Muslim countries without going to bankrupt on wars in Syria, Palestine, Yemen, Iraq, Afghanistan, Libya etc. In fact this is Saudis money that spend on these wars. So give thanks to Saudi idiots. Now I doubt that Saudis are either Christians or Jews that is why they play with Islam and with the lives of Muslims.